This here is Penguin & Peep! Little Moments, a brand new comic compilation created by the artist Monica Bruenjes. Penguin & Peep stars, well, Penguin and Peep – an inseparable duo of a penguin and a tweety-bird looking for day-brightening, feel-good adventures. As the official synopsis puts it; "Penguin lived in the zoo alone, but one day Peep flew by and became his friend. Now she shares her world with him and they have happy days together." What results are adorable little stories of the two finding the fun in whatever situation they find themselves in. And when it's all told via the absolutely cute artwork, you can't help but to go 'awwww'. Penguin & Peep originates as a blog, but is now collected into this high-quality softcover book. The book was funded via a Kickstarter and now that it's out, you can order it via Monica Bruenjes' online store. 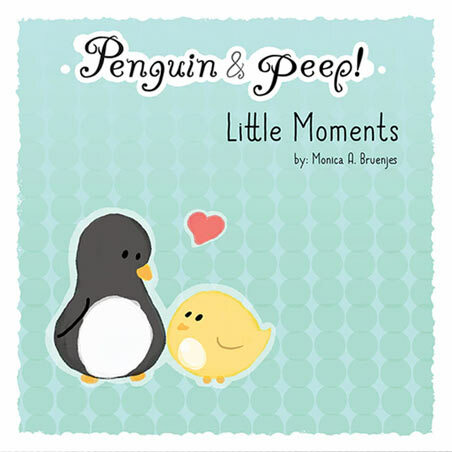 Do give Penguin & Peep a peek; It's one of those things that is guaranteed to brighten even the darkest of days with its cheery outlook and adorable stars!